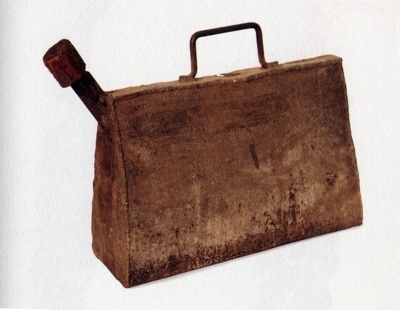 This stunning gallery of improvised household objects from the Soviet Union. Many are utilitarian, but many others are decorative, toys, or personal artistic expressions. The website is entirely in Russian, with broken links and a strange navigation scheme, and very little text. However there is an absolutely fabulous book based on Archipov’s collection called Home-Made: Contemporary Russian Folk Artifacts. It is a gorgeous book, a catalog of sorts, with several hundred marvealous objects showcased. Paired with each artifact is the story of how it was made as told by the maker. It is these stories that give a soul to each thing. I highly recommend the book for all street-users. Thanks to reader Michael Krakovskiy for bringing this incredible resource to my attention. We prepared this aerial according to the dimensions published in Radio magazine. But, you know, resonators are everything. 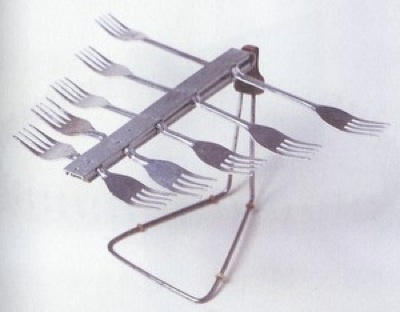 THey were made form forks so that the reception would be better. In my opinion it all worked out very well. The effect was noticeable from the very start. Everyone particularly wanted to watch the programmes from Petersburg. My mother had the forks in her cupboard. She bought them when everything was collapsing around us. There wasn’t anything else but forks to buy in the shops then. They weren’t even very good forks, in the practical sense. But they went well with that aerial. Water boiler. 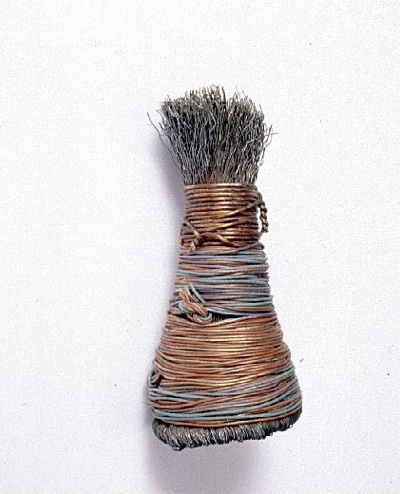 Made from Razor blades, matches, cable, plug – Oleg Baichurin, Saransk, 1989 I used this when I was studying. I lived in halls of residence with a lot of people. Because of this we had to boil water for tea very quickly, but we had an electric cooker which boiled water very slowly. So we kind of thought up this home-made water boiler. 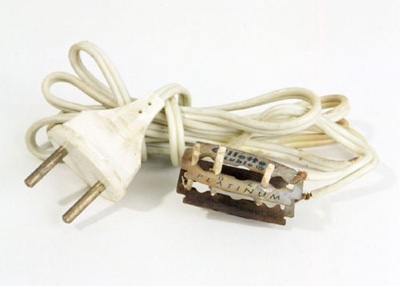 We found a cable with a plug from a kettle, or took it from a small heater and then took two completely ordinary razor blades. We joined them together with matches so that there was a gap between the razor blades. We fastened them together with matches and joined the two ends of the wires. And so you lower this thing, this water boiler, into the water, into a three litre jar and plug it in and the water boils very quickly. A three litre jar boils in about two to three minutes. It’s like the simplest way to boil water. How did we come up with it? Well, in physics there’s a law relating to the properties of conductors. Water is a conductor and using a current between plastic is a common method of boiling water. Standard kettles that you can buy in shops are based on this, and everyone uses them because they are convenient. But in 1987 or 1988 it was difficult to buy a kettle, so for us, that water boiler was a real luxury. There were lots of people, all wanting tea. It was quite a powerful conductor and the cable didn’t heat up. The first time we left just a small gap, but the water started to bubble, the wires started to buzz and the cable started to burn so we then decided to leave a two or three centimetre gap. I had to clean the back of a vehicle which was starting to rust. I had to clean it with a metal brush, but you can’t get everywhere with the type of brush I had. It wasn’t convenient,it really wasn’t and l had to get in everywhere. So I had to make a kind of shaving brush. I took a brush from the guys at the foundry which was going to waste. I got some binding so I could tie-up the bristles like a shaving brush. It turned out to be an excellent metal brush.It’s narrow and it’s very convenient to use it to get in there where the rust has appeared… and in other places where a big brush can’t fit and you need a small metal brush. With this brush you can get in there, once, twice, give it a good scrub and that’s your lot. Finally I used some ‘anti-corrosion’ and then I was able to paint it. Television aerial Aleksandr Tarasov, Ramenskoye, Moscow region, 1980. Made from table lamp base, textolite, a conductor, screws. This is a television aerial, for the 33rd channel, which in the period between 1978 and 1980 was transmitted in Leningrad. There weren’t any antennas for sale and the magazine Radio published some different plans for making them. 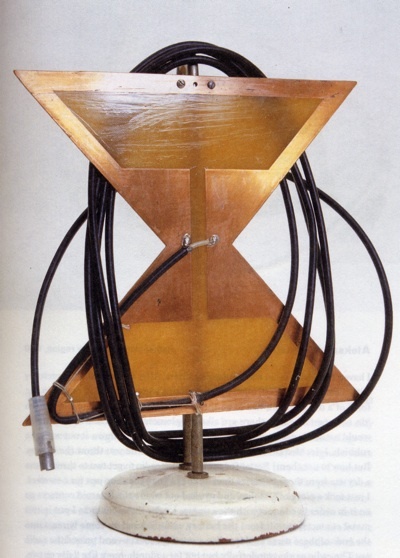 Basically this antenna was made using a sketch from this magazine. Instead of cutting it out of a sheet of metal I took a piece of fibreglass laminate, which is plastic with foil on one side. And the tracks were cut out from foil according to the sizes published in Radio. As for the base, I used a base from a table lamp – it was necessary to fix it on with something. There’s nothing miraculous about this construction, I was more amazed that Arkhipov saw something in it. I consider it to be a very simple thing, made for a purpose between other jobs. The signal from the antenna is received through this cable and then sent to the TV. The cable has to correspond with the elements of the antenna in order to effectively transmit the signal coming from the antenna. Apart from that, this cable has to go around the antenna in a certain way so that the wave resistance in the current of the cable connecting the antenna matches the ‘line’. Well, here you need to use your wits. How can you lay this cable around the antenna? Around the edges some openings were drilled and thread was put into them and then with the method they use in radio electronic equipment it was tied on. They bind sausages up like that. And because of this it reminds some people of plaits, or a sausage. As recounted by Vyacheslav’s brother Sergei: There weren’t any petrol cans back then, but we still had to drive around the place. The same goes for petrol stations, not like now – one on every corner. You had to have a can for petrol and there weren’t any, so we made them for ourselves. My brother made his own too, he had a few. Fill up two or three and you could drive anywhere. They took fifteen or twenty litres. There were all kinds and one turned out shaped like a briefcase. He used to drive the boss – maybe that’s why it turned out like this. It’s a really handy item and really easy to make. 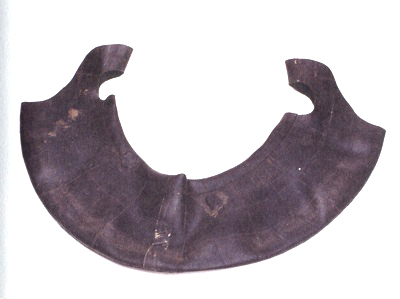 You take an old inner tube from any wheel and cut off the part with the hole In it. Then you cut out handles and you have your bucket! It’s light, doesn’t take up any space, throw it in the boot and away you go! The only thing that’s awkward about it is you can’t stand it on the ground, but it’s OK for scooping up water and washing the car, and all sorts of other things. All the cars round here have them. Why buy it when you can make it yourself. 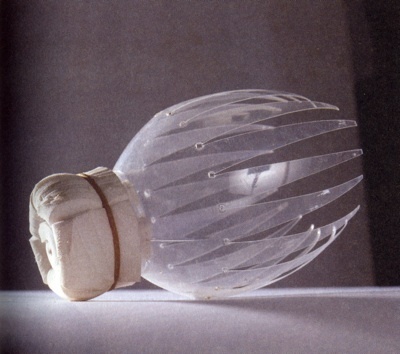 I took a plastic bottle and cut out something looking more or less like a shuttlecock. These stabilisers are supposed to be the feathers. And to soften the impact I covered the end with soft pieces of material and an elastic band. 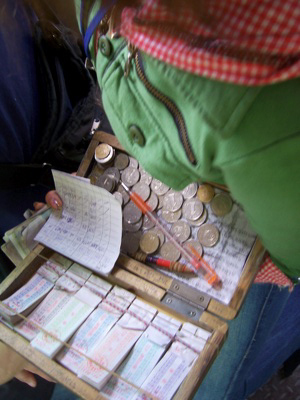 While riding a local bus in a village near Shanghai China I noticed a rather elegant device for ticketing. It’s a wooden box that holds stacks of tickets under a rubber band on one lid. The other lid holds the coins for change. The ticket girl rips off the proper ticket/receit for a rider and then digs for the change visible on the other tray. She can close it up when she needs to hop off at a stop, and then opens it quickly again. Elegant solution. Designed to move people, bicycles and motorbikes are actually used to move almost anything that can be moved. 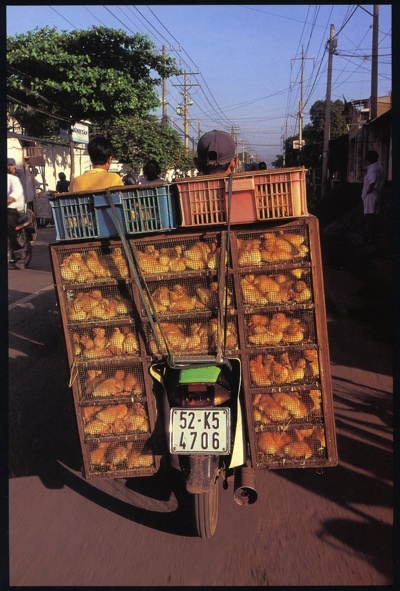 In my travels in Asia I’ve seen bikes piled impossibly high with all manner of cargo, from livestock to cardboard. It’s really astounding what a bike can balance and transport. 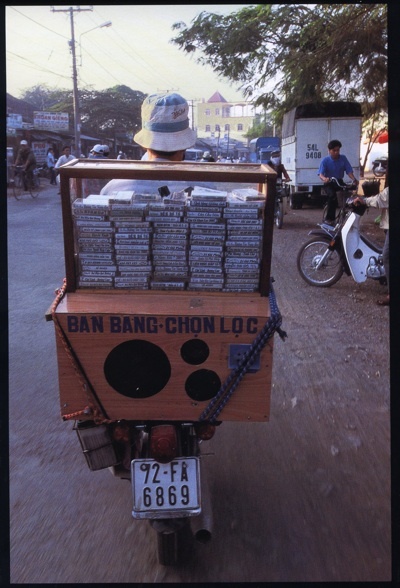 Dutch photographer Hans Kemp has focused his lens on the motorbike cargo culture of Vietnam. He’s gathered his collection of 148 examples of the unintended cargo of motorbikes into a very finely printed photobook, called naturally enough, Bikes of Burden. Here are a few examples from his book, which is also available on Amazon. 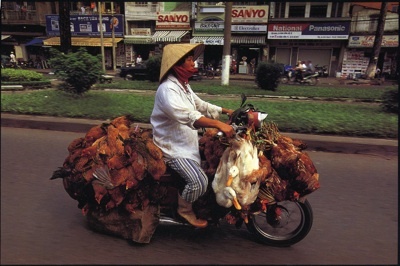 It’s a remarkable living zoo of chickens and ducks on the way to the market. When the ducks are tiny they are taken to farms in smaller cages. Then farmers will raise the ducklets. This guys sells music cassett tapes and offers a tiny hi-fi set to test them out and also serve as an advertisement. Of course the tapes are all pirated. Reader Steve Portigal pointed us to his friend Victor Lombardi, who captured this cool hack. 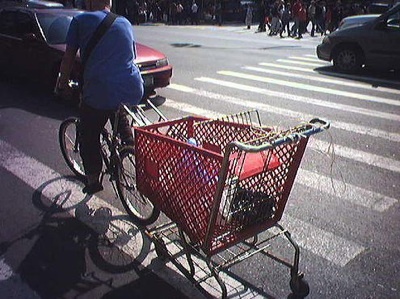 A guy riding his bike down Canal Street in NYC while towing a shopping cart. It apparentlhy serves as a found and free hauling trailer. I would love to see the hitching details. Roger Beck makes and collects housetrucks. “Many people have the dream of being a gypsy–a dream of travel & freedom. 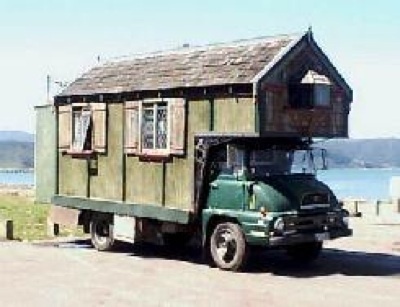 For every housetruck or housebus, there is an artist who has built it to meet their individual needs. 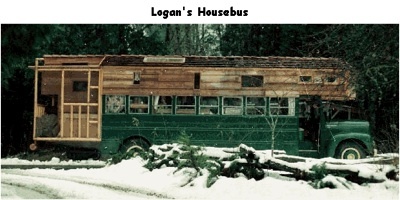 I have hundreds of housetruck and housebus photos including many unique, one-of-a-kind vehicles.” Indeed if you visit his site, Housetrucks, you’ll find a few of his 350 images. The rest are available from his self-published book. This cute housetruck was found in New Zealand. This is a side view of a long housebus with porch! From the ever-entertaining blog of musician/pop-star David Byrne comes this phone-cam picture he took during a religious procession encountered on “9th avenue in the 50s” in New York City, September 2006. 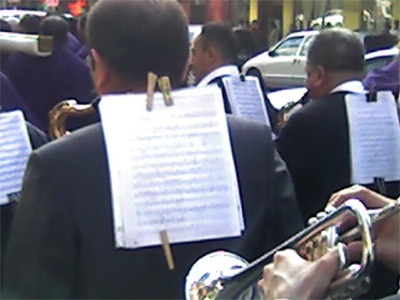 It’s a novel way for the brass section to hold their sheet music. Lloyd Kahn sent over a cool picture he took in Thailand. 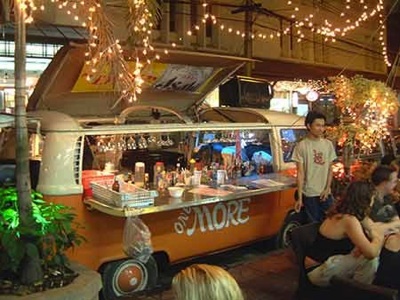 It shows a VW van converted into upscale street bar in Bangkok. It’s part of his collection of the diverse ways people around the world create shelter. It’s all in the details. 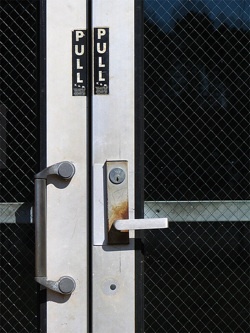 Why do door handles need to be symmetrical? In fact there may be good reasons to have them different — perhaps to invite visitors to use one side before the other. But in this case it looks like it’s simply a sign that one can purchase a replacement part of one type but not the other. In other words one side is more repairable then the other. Much of street use is repair work. And sometimes repair work is improvement. A good question surfaces: with this repair is one side of the door now more usable than the other? If you came upon this unequal set, which side would you reach for? Thanks to Splintered*Light for posting this on Flickr. In most parts of Asia, local elections are marked by touring vans sporting megaphones which broadcast political commercials. They drive through neighborhoods at 100 decibels blaring campaign slogans for their candidate. Most of the vans also sport billboards on top. Here is a street use version in Minnesota. James Everett is an independent candidate for governor of Minnesota who is using a portable sonic platform for his campaign. He calls it the Wagon of Revolution. 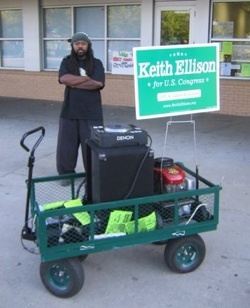 Previously he used the same contraption while campaigning for a Congressional candidate. The cart contains a generator and sound system. Thanks to reader Paul Schmelzer who mentioned this on his blog Eyeteeth. 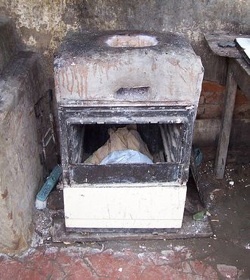 I can’t tell what this stove in Brazil was made from. Was it an oven with new clay top? Was it a trash can? Was it an old dishwasher? Something found was modified to serve as a stove feed with litter or scrap. Found on Comingtobrazil.